(03-20-2019 08:37 AM)Brunchinese Wrote: However, I still can not turn on FREE SYNC fution for us non-free sync monitor (MODL: SAMSUNG C27JG5X). Could you tell me in more specific way of turning it on. No, that's not what CRU is for. (03-19-2019 08:33 PM)Twone Wrote: Hey! Can you tell me what the "SCDC present" feature is under HDMI 2.0 support? I just bought Samsung NU7100 4k TV and connected it with a quality 10m cable to my PC with RX 580. Every time I power on/off the TV my main monitor blinks, sometimes the TV's resolution gets reset to native 4k of what I've set it (1080p), sometimes it takes ages to find the signal and all sorts of weird problems. If I turn this feature off on CRU or delete HDMI 2.0 block all together everything works normally so I'm wondering if it's safe to disable this and what it even is, why is it being enabled on default if it causes these problems. SCDC is the Status and Control Data Channel. The HDMI 2.0 specification states that SCDC is required to support TMDS character rates greater than 340 Mcsc (same as the pixel clock MHz at 8 bpc), which means it's required to get 3840x2160 @ 60 Hz 4:4:4. 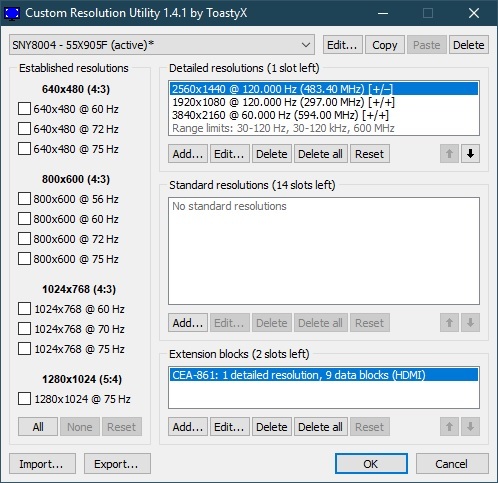 Deleting the HDMI 2.0 data block would limit it to HDMI 1.4 speeds, which would also prevent 3840x2160 @ 60 Hz 4:4:4 from working, limiting it to either 30 Hz 4:4:4 or 60 Hz 4:2:0. When you say 10m, do you mean 10 meters? Long cables can cause signal and handshake problems at high data rates. Yes, I mean 10 meters. I have the same problems with a shorter cable like 1 meter one, my GPU loses the signal to the TV for a couple of seconds whenever I power it off or on which makes my main monitor blink and flicker until the signal gets stable. It's fairly problematic as when SCDC feature is enabled the resolution gets reset to 4k whenever my GPU is trying to get the signal to the TV again, and with the 10m cable it takes a long while, which can make my main monitor flicker for up to a 1 minute. It does this with shorter cables too, even with a 1.4 cable which I've tried, it just finds the signal quicker. However if I disable SCDC present or delete the HDMI 2.0 block and switch to 1920x1080 which I mostly use anyways the signal doesn't get dropped nor the resoluton gets changed, even when I power off the TV so my main monitor doesn't blink or flicker, which is how I want it to be. I was just wondering what causes this behavior, I can't say it's the cable as I've tried multiple. AMD driver issues perhaps? (03-21-2019 04:18 AM)Twone Wrote: Yes, I mean 10 meters. I have the same problems with a shorter cable like 1 meter one, my GPU loses the signal to the TV for a couple of seconds whenever I power it off or on which makes my main monitor blink and flicker until the signal gets stable. It's fairly problematic as when SCDC feature is enabled the resolution gets reset to 4k whenever my GPU is trying to get the signal to the TV again, and with the 10m cable it takes a long while, which can make my main monitor flicker for up to a 1 minute. It does this with shorter cables too, even with a 1.4 cable which I've tried, it just finds the signal quicker. However if I disable SCDC present or delete the HDMI 2.0 block and switch to 1920x1080 which I mostly use anyways the signal doesn't get dropped nor the resoluton gets changed, even when I power off the TV so my main monitor doesn't blink or flicker, which is how I want it to be. I was just wondering what causes this behavior, I can't say it's the cable as I've tried multiple. AMD driver issues perhaps? It sounds more like a handshake problem. It's possible SCDC is not present when the TV is turned off, so the video card has to renegotiate the connection. SCDC and HDMI 2.0 are required to support HDMI 2.0 speeds. 1920x1080 doesn't require HDMI 2.0. Does anything change if you disable HDCP support for the TV in Radeon Settings? Why can't I use 1080 by 1080 I saw on a post on Reddit that I could use it. (03-23-2019 01:13 AM)nervous Wrote: Why can't I use 1080 by 1080 I saw on a post on Reddit that I could use it. According to this review, it supports 2560x1440@120Hz but I cannot manage to enable it. I can run fine 3840x2160@60Hz, 1920x1080@120Hz 10-bit but when I select 2560x1440 in Windows settings, it tells me "Desktop Resolution 2560x1440, active signal 3840x2160@60Hz 8-bit with dithering". You need HDMI 2.0 to get 3840x2160 @ 60 Hz 4:4:4 and 2560x1440 @ 120 Hz, but I don't see that in your screenshot. According to the article, "4k @ 60 Hz @ 4:4:4 or 4:2:2 is only possible on HDMI inputs 2 and 3, and only when 'HDMI Enhanced Format' is enabled." (03-06-2019 04:49 PM)ToastyX Wrote: The output is a stream of pixels sent at a fixed rate. The pixel clock is the number of pixels sent per second including blanking. FreeSync is like increasing the vertical blanking in CRU without changing the pixel clock. It always sends at the same rate as 75 Hz and varies the blanking to delay the next refresh. The monitor probably has a limit for how long the blanking period can be. Static 37 Hz doesn't have a delay beyond normal blanking. It just sends at a slower rate. Appreciate the very clear explanation. Your explanation made me thinking: what if i minimize the standard blanking so that the freesync induced extra blanking JUST falls into the range of my monitor. And it worked! It took a lot of tweaking with basically all settings (back/front porch and sync both horizontally and vertically) and now my monitor displays 37-75hz perfectly and i have full LFC now! I only have very rare tearing if the FPS is between 37-38 (i suspect actually it's limited to a decimal range) but that is hardly noticably in practice. So thanks a lot for your help Toasty! For others having my monitor (LG 29UM59-P), please find below the settings that worked for me. Man, I have been having a similar problem for so long, finally your settings worked on my monitor too. I have LG 22MP68VQ, with your settings I am using 37-76Hz, but I gotta ask which radeon driver version are you using? Because previously I was using my own CRU settings of 37-74Hz with 74Hz being "LCD Reduced" but for some reason I got sever stuttering whenever my FPS drops to 32-37 range with any driver released after 18.6.1, so I am still using 18.6.1 driver to this day. If your settings worked even for newer driver then finally I would upgrade my driver. Cheers! Edit: I updated to 19.3.3 to give it a shot and to my surprise it works even better than 18.6.1 with your settings, running 37-75Hz, with no issues so far.